One of the Erzullie Resort 2013 dresses is this printed dress. It has a small bohemian vibe to it but rest assured that it can translate from one occasion to another. 1. FOR WORK: Wear a black balzer over this with a solid colored belt, skinny slacks and heels. 2. 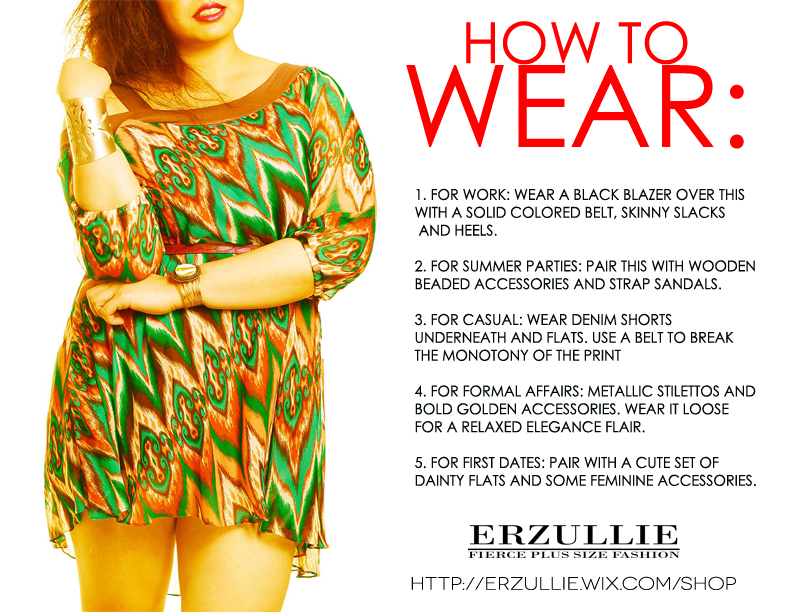 FOR SUMMER PARTIES: Pair this with wooden beaded accessories and strap sandals. 3. FOR CASUAL: Wear denim shorts underneath and flats. use a belt to break the monotony of the print. 4. FOR FORMAL AFFAIRS: Metallic stilettos and bold golden accessories. Wear it loose for a relaxed elegance flair. 5. FOR FIRST DATES: Pair with a cute set of dainty flats and some feminine accessories. You can purchase this online (http://erzullie.wix.com/shop) or in the Erzullie Pop Shop on May 18, 2013, Saturday (6:00pm-9:00pm) at the Caffeccino, Eastwood City, Quezon City. For more information about the POP SHOP, CLICK HERE.